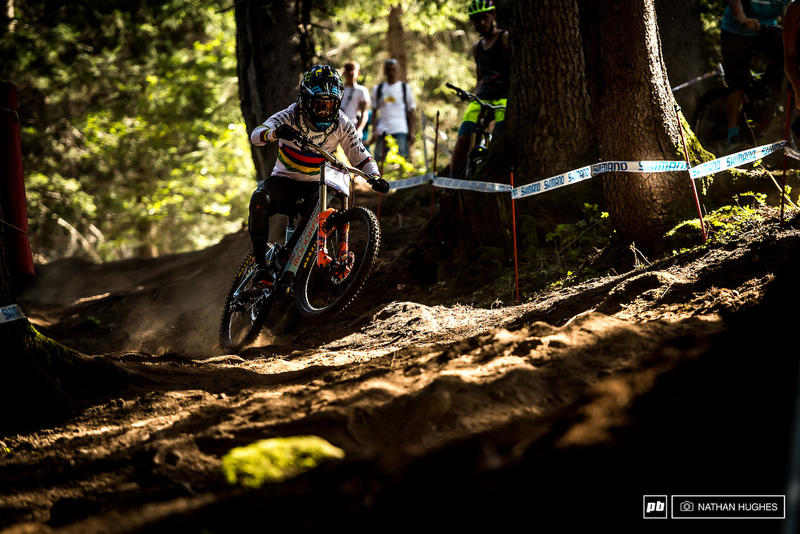 After six rounds through Europe and Canada this is it, the final World Cup round of 2017, about to be battled out on the legendary track of Val di Sole. 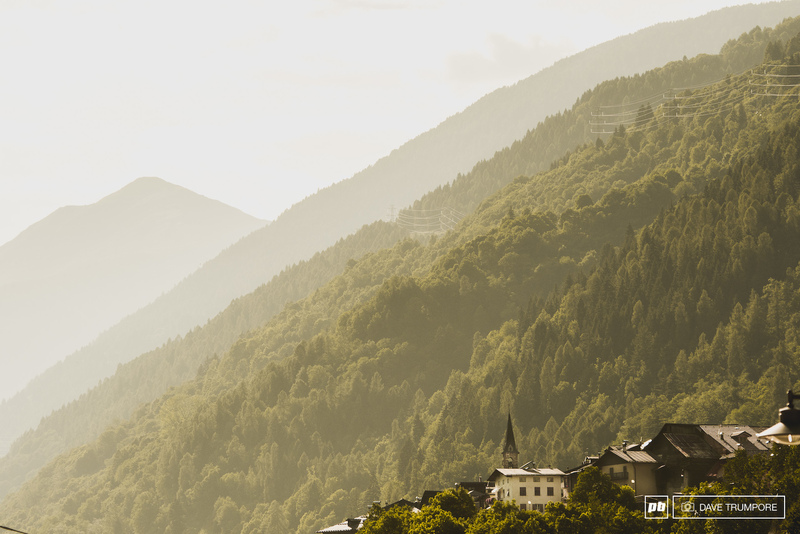 A hill that is no stranger when it comes to deciding champions, having held World Camps one year ago, and World Cup finals the year before that. On a track known for dishing out punishment from top to bottom, and with a tight points races in many categories, the Black Snake is sure to live up to its reputation. As is often the case in Italy's "Valley of Sun" the weather is hot and the track is super dry and dusty. The layout is similar to last year's Worlds track other than the first woods section that reverts to the track of 2016, and a few tweeks here and there to help with flow. Just small changes to be sure a heavily used race track stays fresh and keeps everyone on their toes a bit. 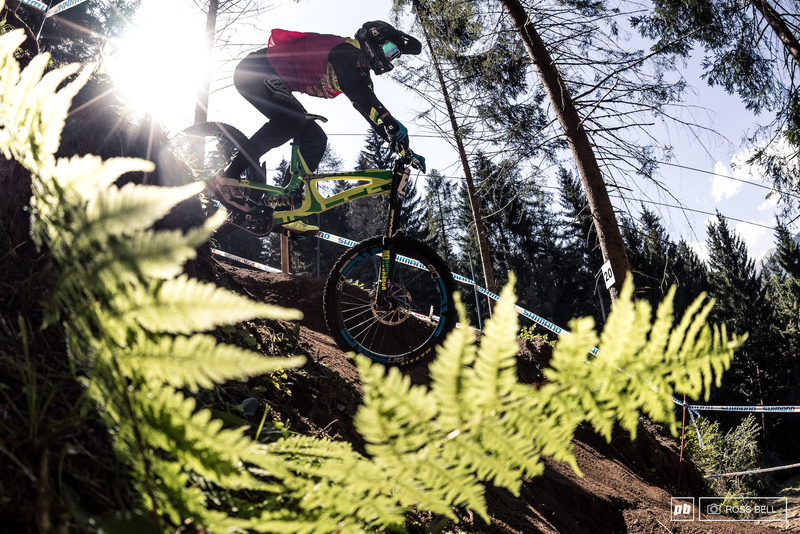 After a day of smashing rocks and roosting fresh loam we did get a sneak peek as to who's on the gas, but more than ever, it really was just a peek. 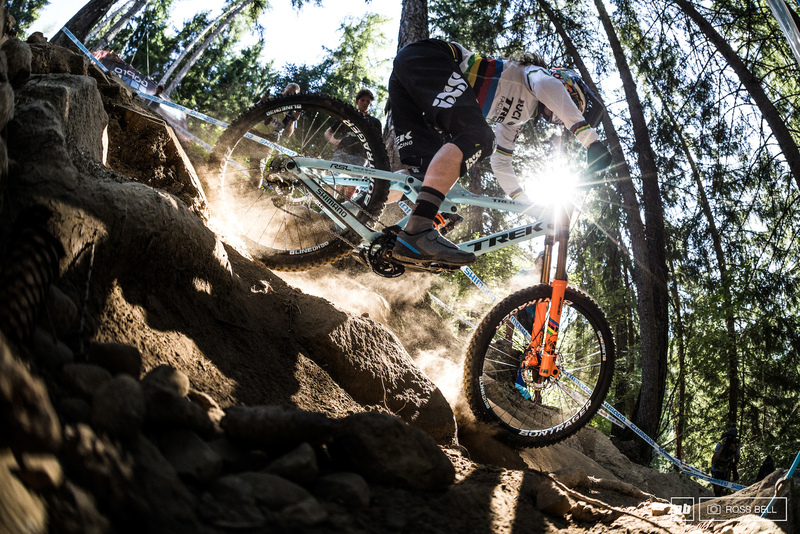 It's no surprise to see the World Cup leaders, Greg Minnaar and Myriam Nicole, at the top of the list for timed training. But as you can tell from who isn't near the top times, a lot of riders are keeping their cards close to their chest, a lot closer than usual. 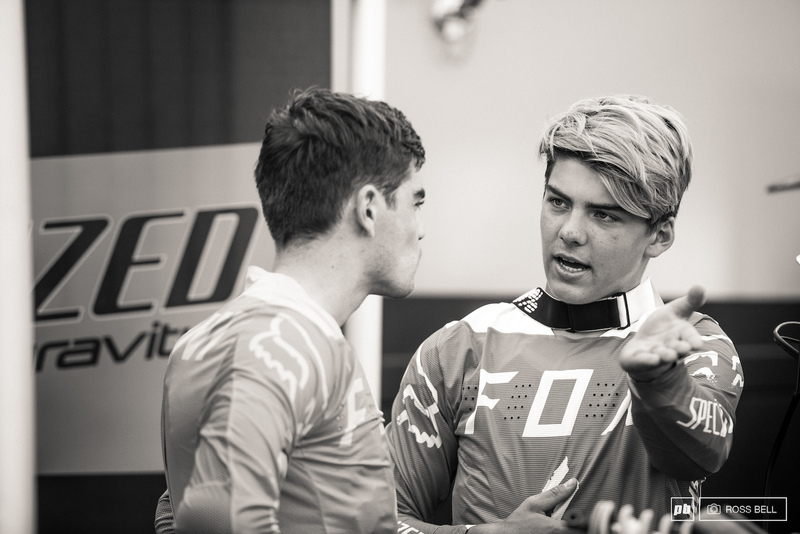 Tomorrow will bring qualifying, and with the last points of the year on the line before Saturday's final, you can be sure everyone will be on track with guns blazing very soon. It is called the valley of the sun after all. 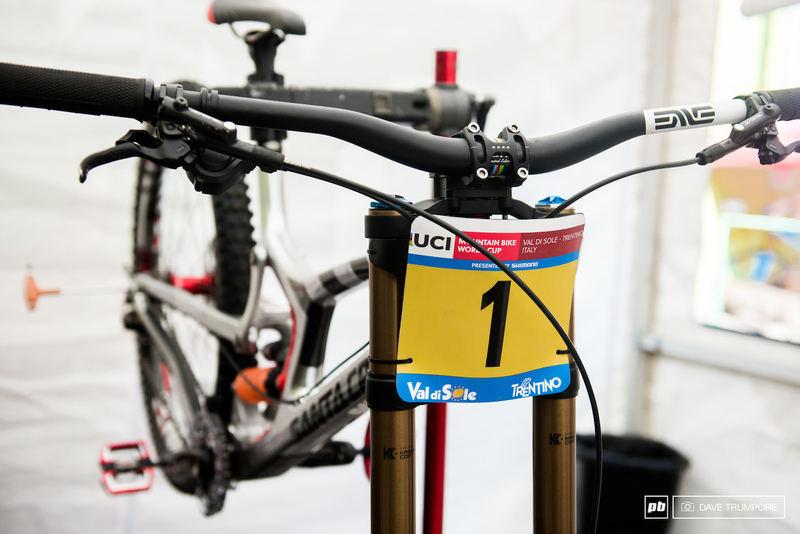 There are barely any points to spare if Greg Minnaar wants to leave Val di Sole with this number plate. 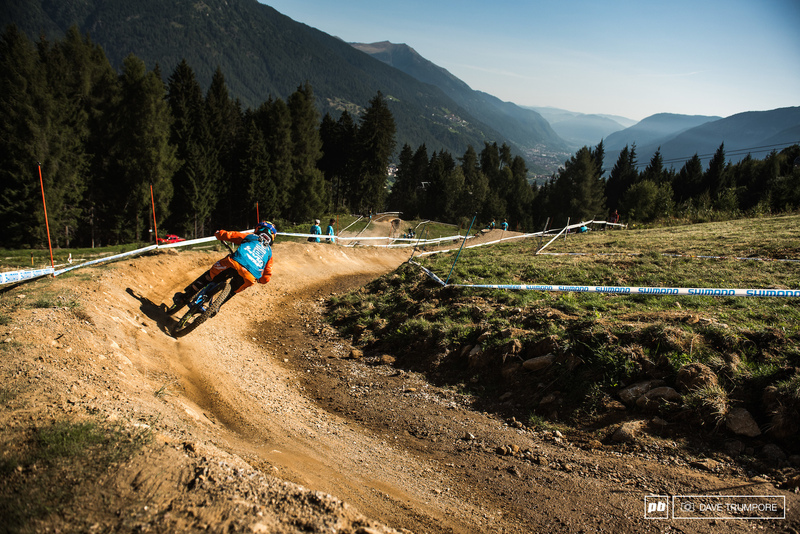 The 2016 World Champs silver medalist gets ready to find to that same speed on Italian soil. 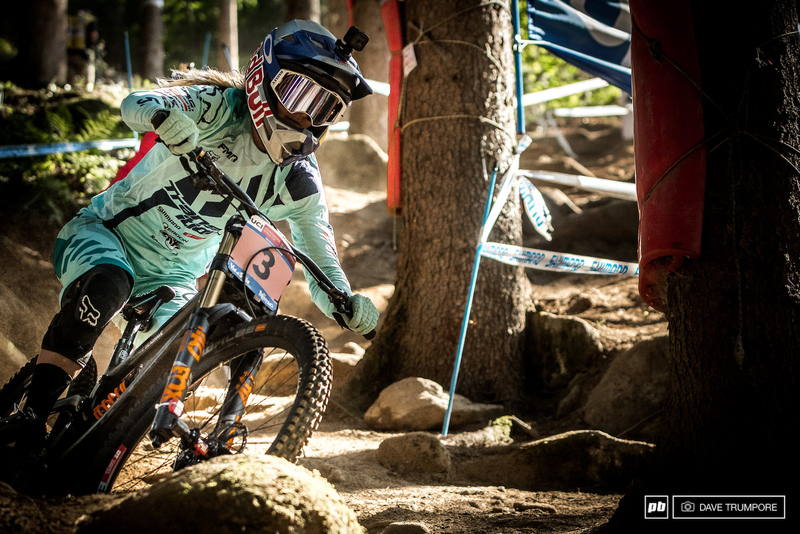 Tahnee Seagrave had a rough morning, taking some big crashes as the holes started to come out from under all the loam. 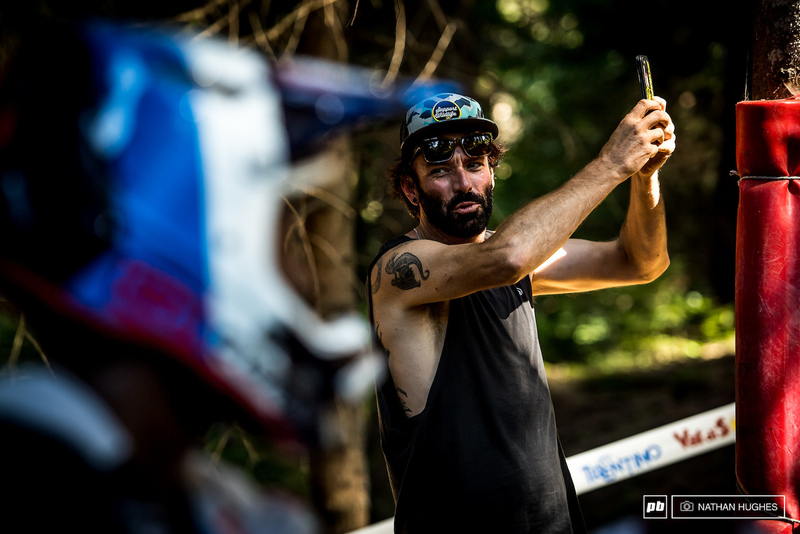 Danny Hart's mechanic, Christian Schandl, makes the final checks before sending his rider out onto the hill where he took gold last season. Jack Moir and mechanic, Chappy Fiene, try to remember where he parked his car. It's okay, he didn't bring one. 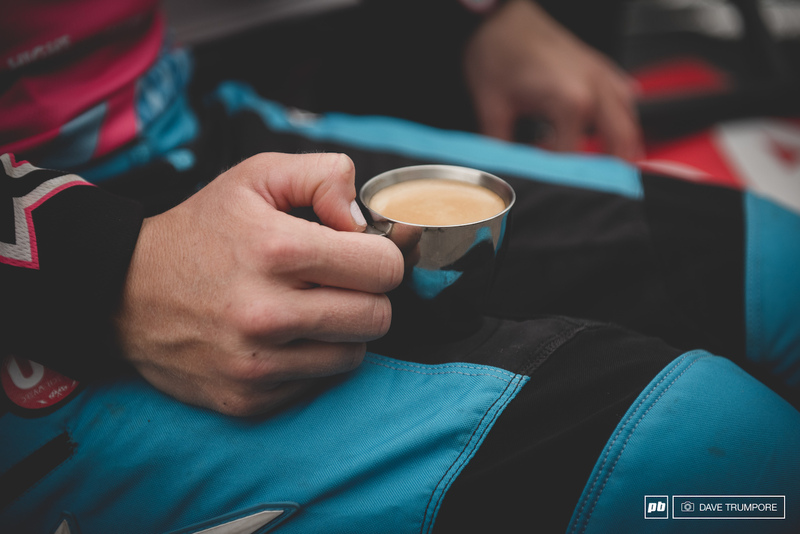 More than a few riders were hard on the espresso this morning as they tried to kick the jet lag and nine hour time swing coming from Crankworx. 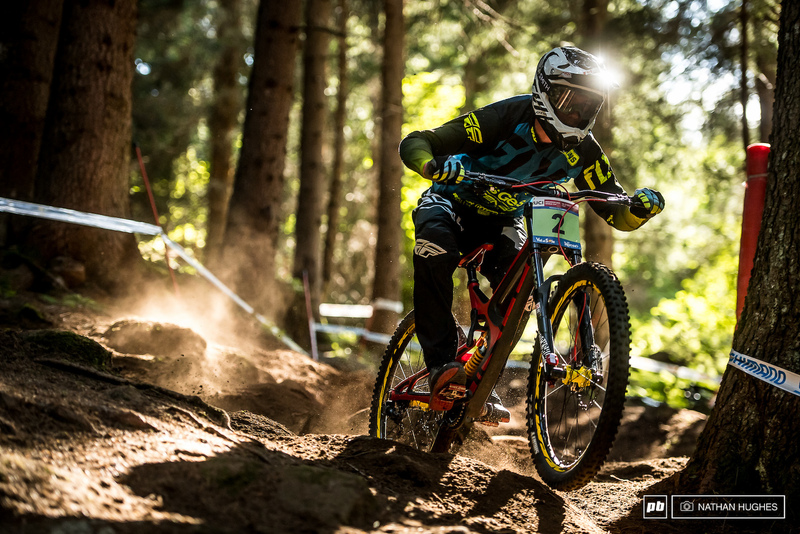 After announcing his retirement from World Cup racing last week, Markus Pekoll will be hoping for a good send-off in the golden VDS loam. 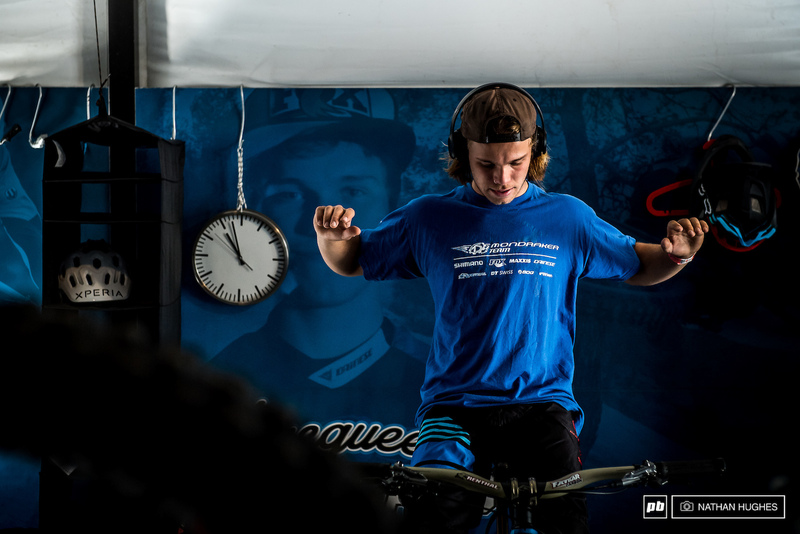 Finn Iles has the junior title locked up, and now he is looking to chase down the times of the top 10 elite riders. 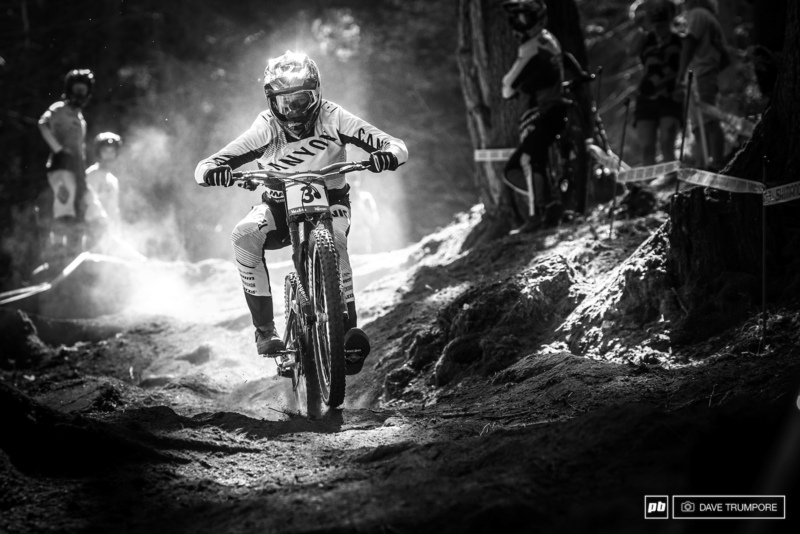 You can always count on Kiwi, Sam Blenkinsop, to get rowdy in the loose stuff. 6th in TT. 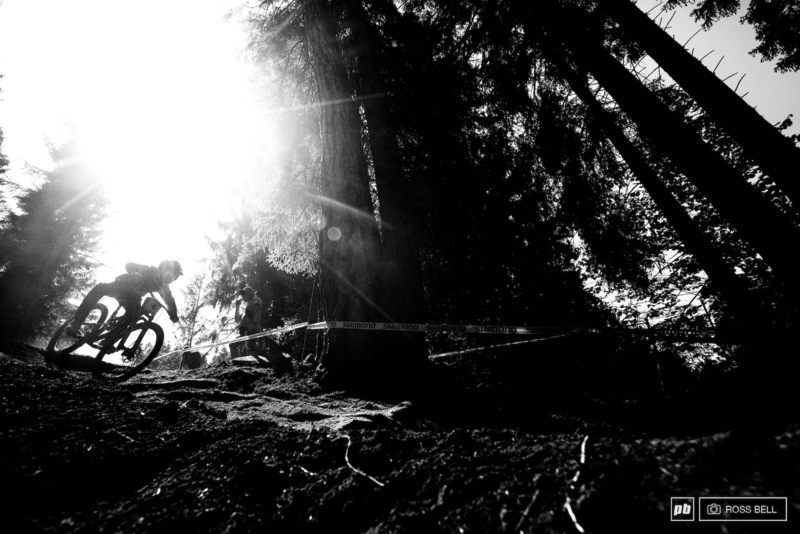 Myriam Nicole dwarfed by the high pines here as she sets about going fastest in timed training. 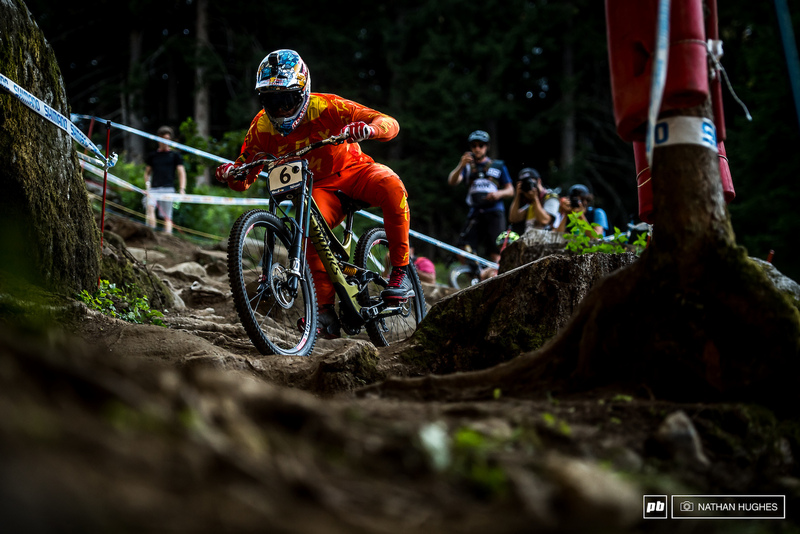 Jacob Dickson will be feeling his hands after Mont Sainte and Whistler back to back, but will all that bike time be worth the blisters? 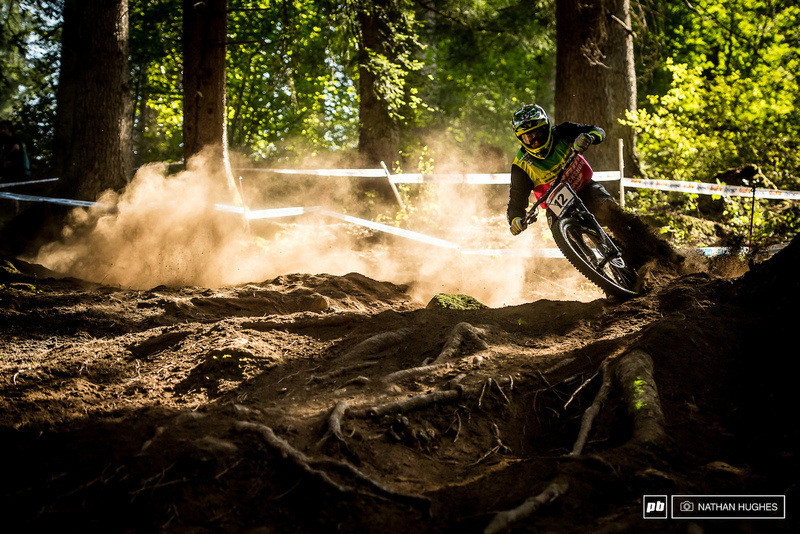 Dakota Norton blasting berms for a casual top 20 TT. Iles cruising his penny farthing between the pines. 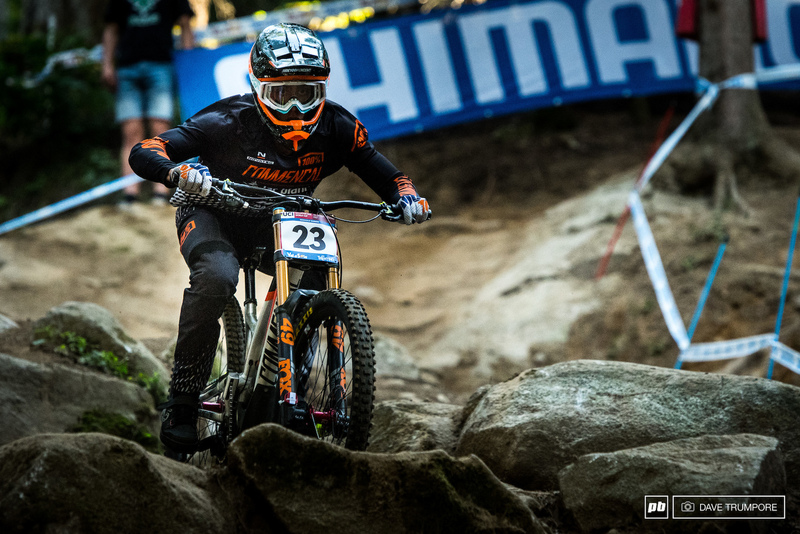 Luca Shaw has had more bad luck than good this season, but he is on pace with the top guys and always a podium threat. 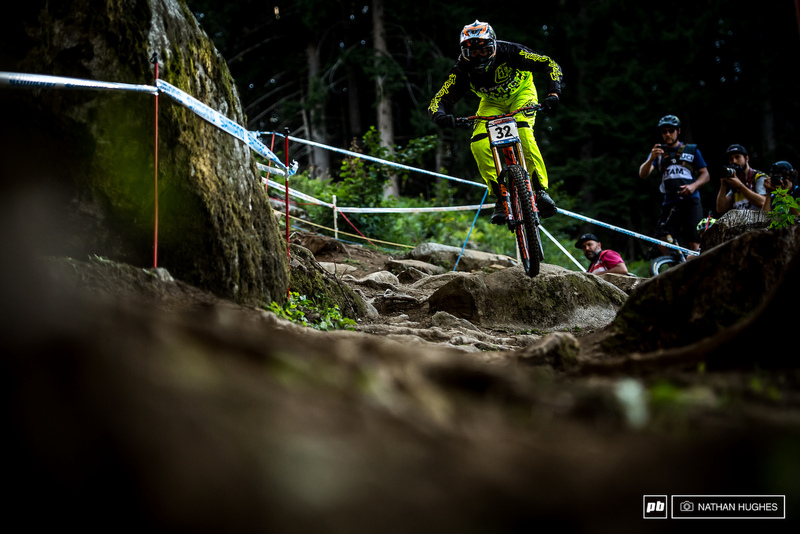 Brook Macdonald attacking the Val di Sole steeps is an eye-opening experience. 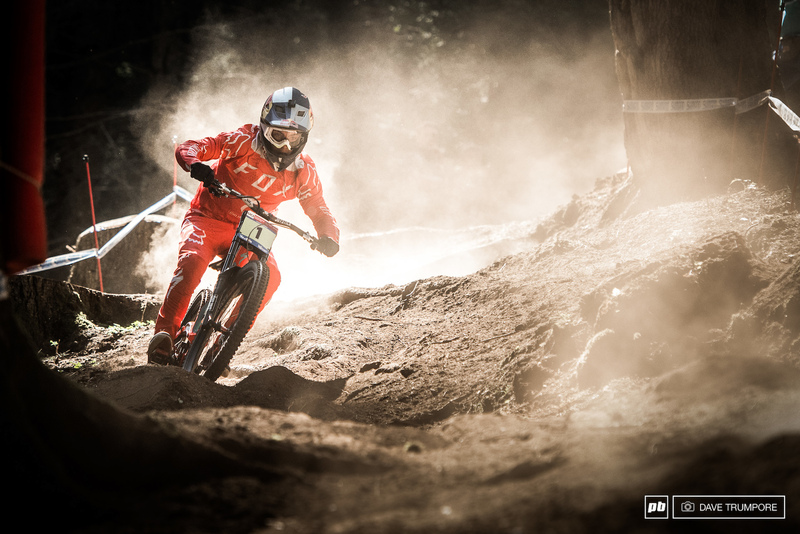 Aaron Gwin typically keeping his cards close to his chest in timed training. He'll have to hang it out tomorrow in qualifying with valuable points on offer. 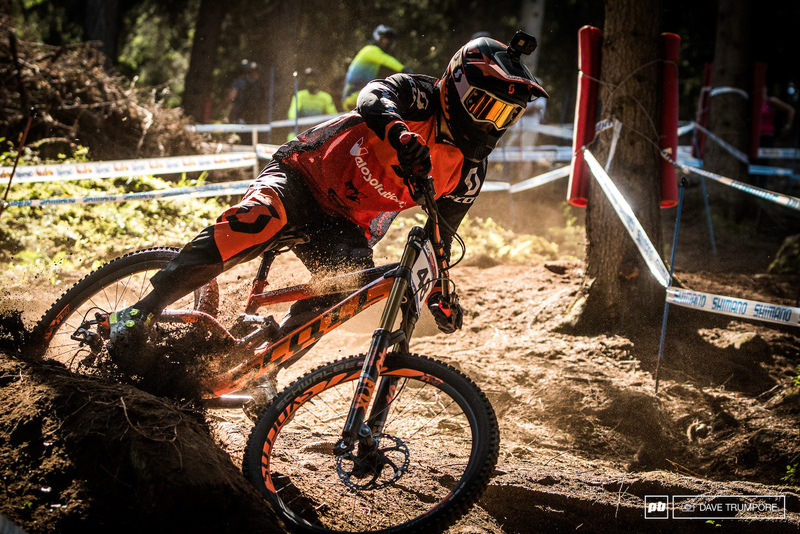 Loic needs to push hard if he wants to get into the top 5 in the overall on Saturday. 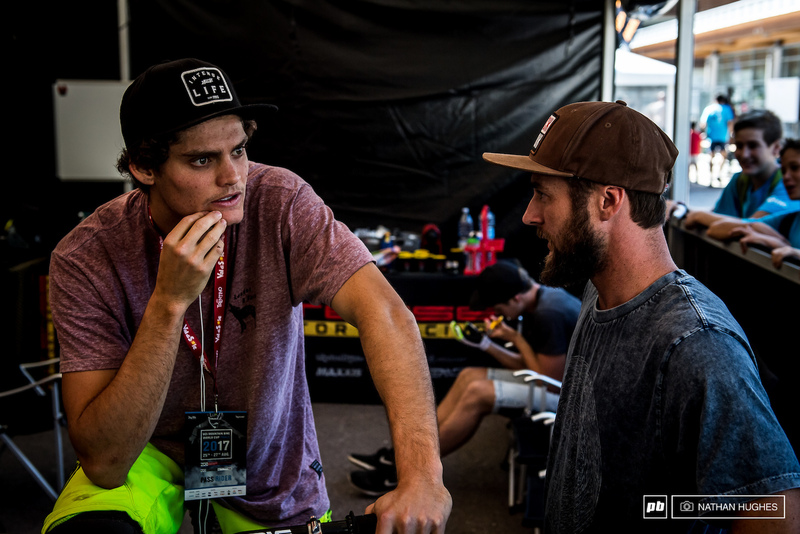 Finn and Loic talk line choice after their first runs this morning. 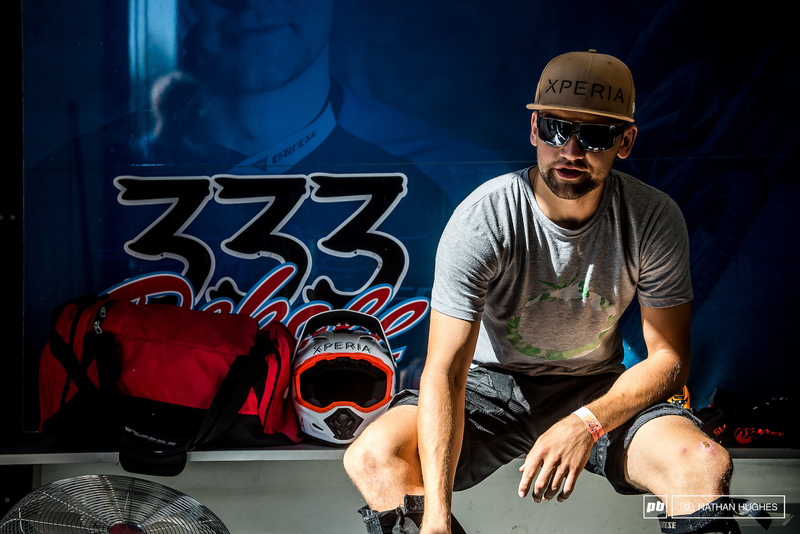 After 8 years at the races, Pekoll decided it's been a good run... now to beat his 12th place here last season. 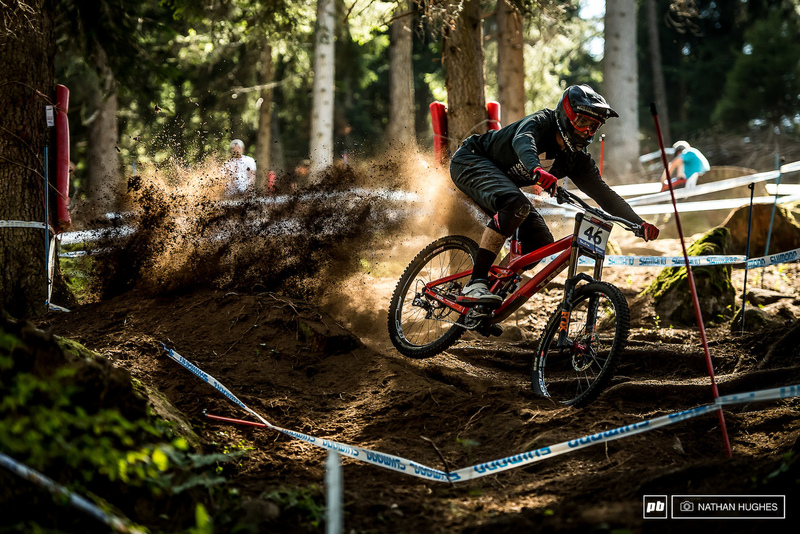 Aaron Gwin was seen smashing the rough sections of the track at warp speed in practice, but come timed training he kept it all a bit secret. 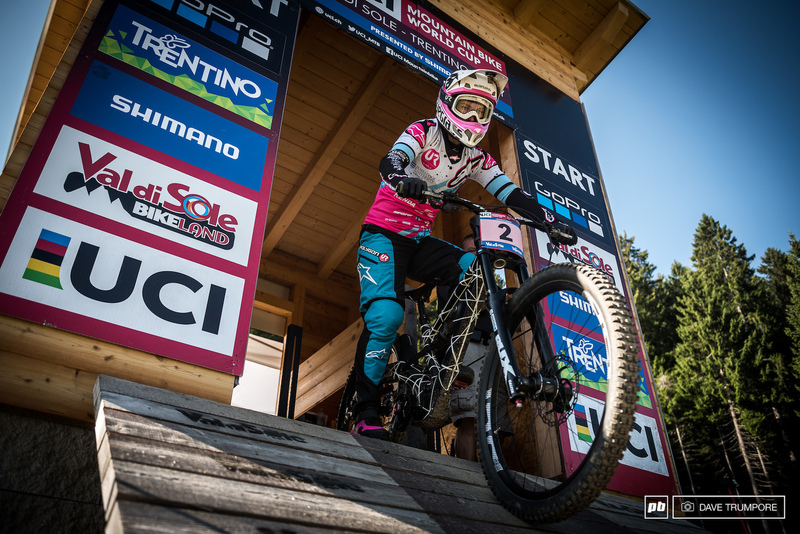 The points are still tight at the top of the Women's field, especially for the number two spot between Tahnee and Tracey. 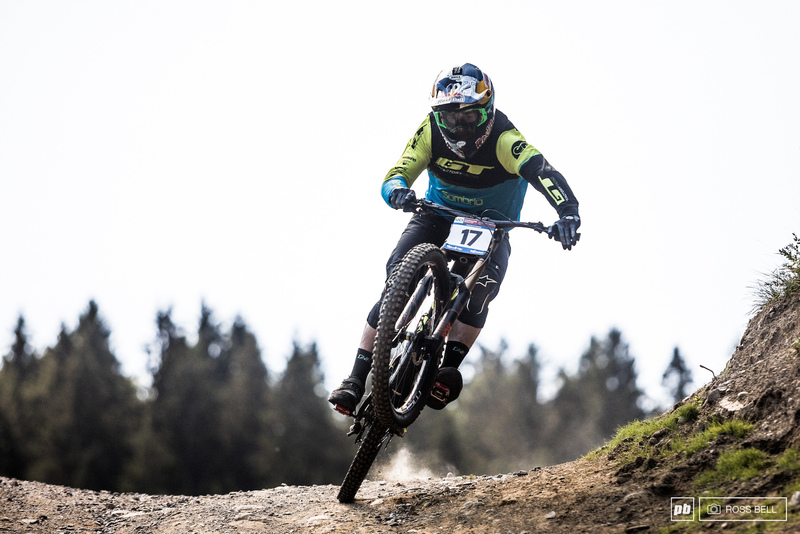 With the focus on the leading title protagonists, Rachel Atherton will look to get back to winning ways this weekend. 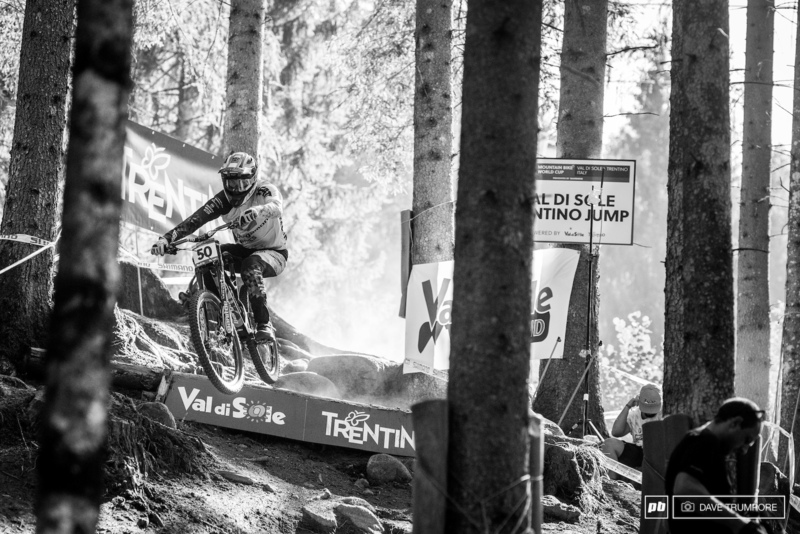 Tracey Hannah drops in to get things going in Val di Sole for World Cup finals. 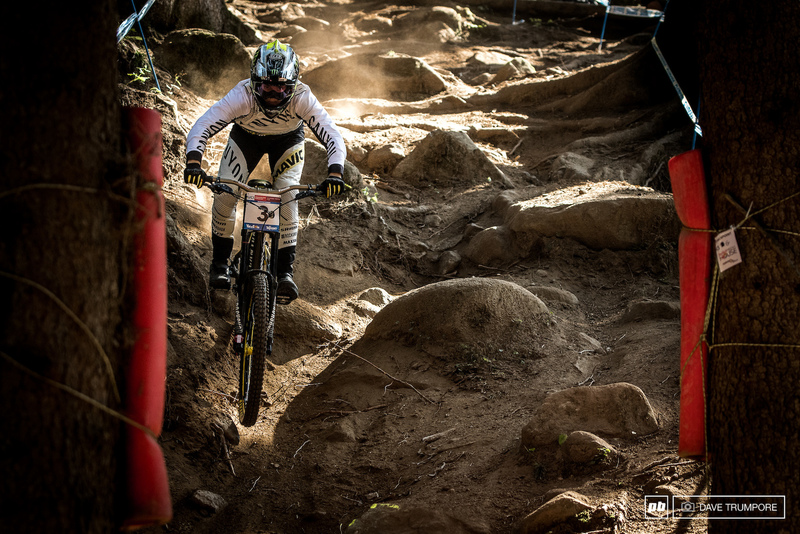 Hart on the prowl for a quick timed training lap, coming up 6th less than 5 seconds behind Minnaar. 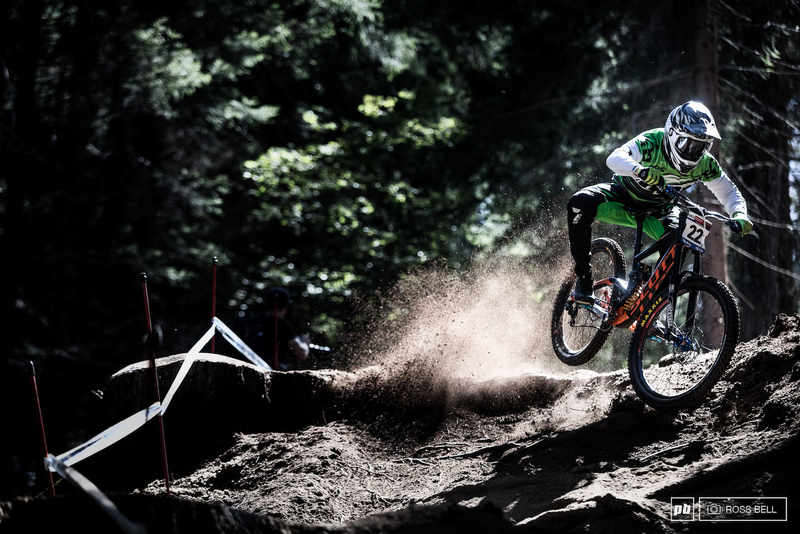 Dean Lucas was on the charge this afternoon, smashing a lot of sections faster and looser than most. 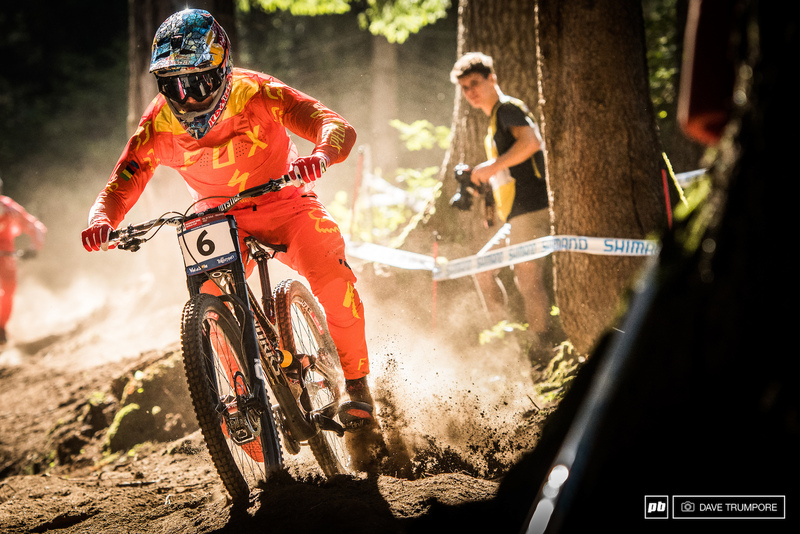 Better believe Sylvain Cougoureux will be out to defend that number 2 spot this weekend. A 110 point safety net must feel pretty great... Is Myriam Nicole about to run away with the season of a lifetime? There is no missing the Intense boys on track this year. Charlie Harrison hangs off the back of the M16. 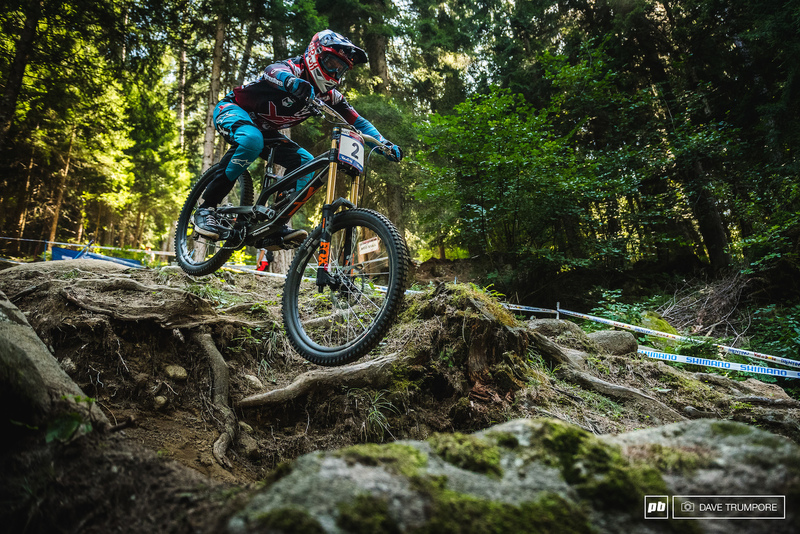 Vaea Verbeeck's bike didn't complete the journey from Canada to Italy leaving her to scour the pits for an alternative, the solution being Tracey Hannah's old bike. 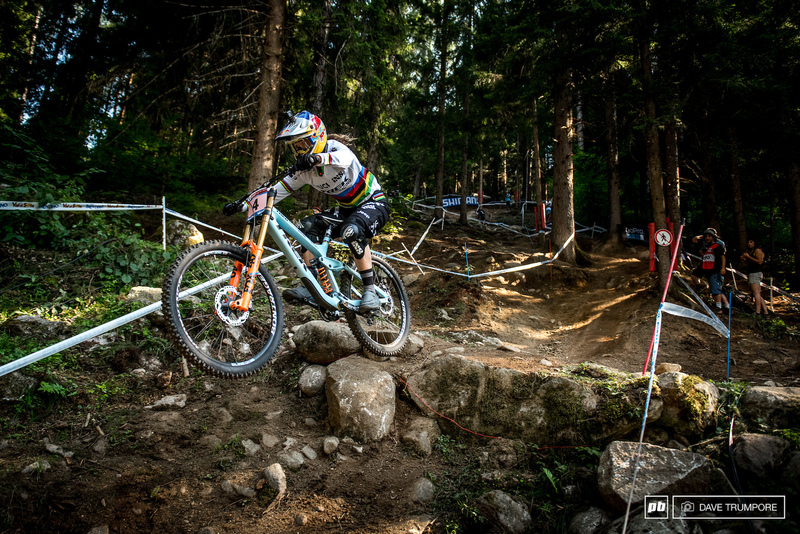 Loic Bruni running his telemetry set-up on a bike that looks noticeably more dialled than the competition on track. 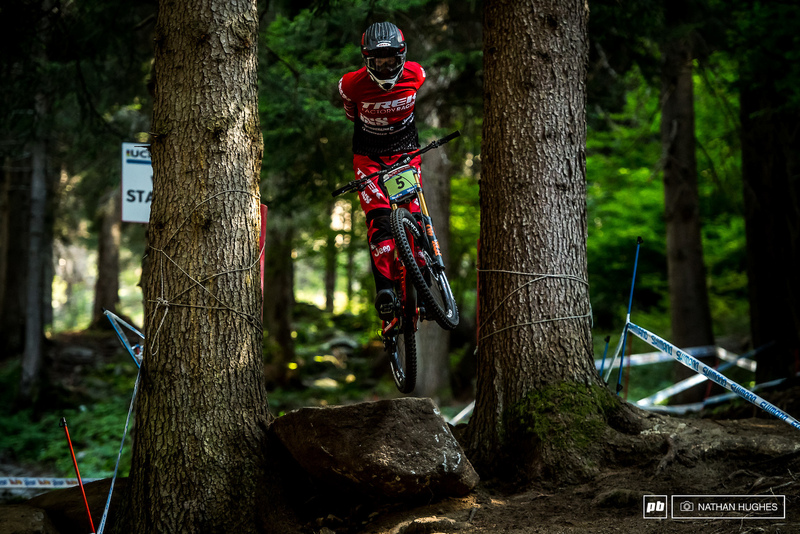 Laurie Greenland took home a silver medal here at World Champs last year, so we have to pick him as one of the favorites this weekend. 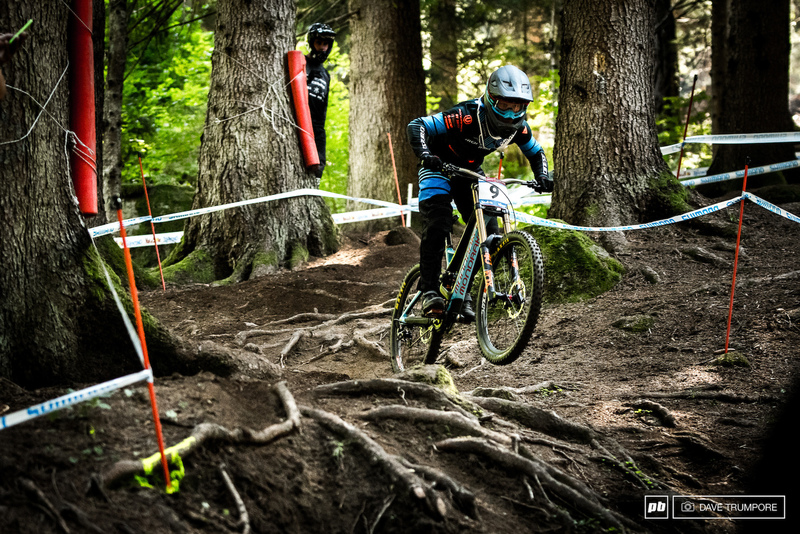 Kaos Seagrave trying to find the flow on the roughest track of the season. 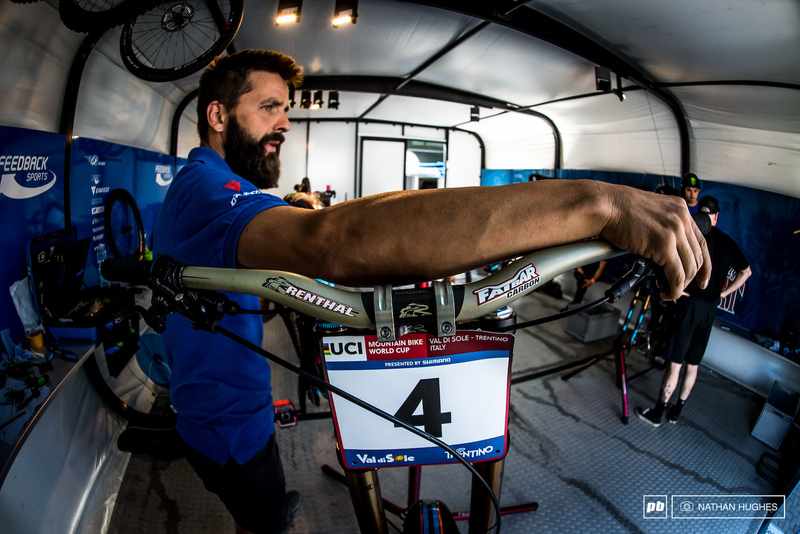 Amaury Pierron went 4th in timed training. 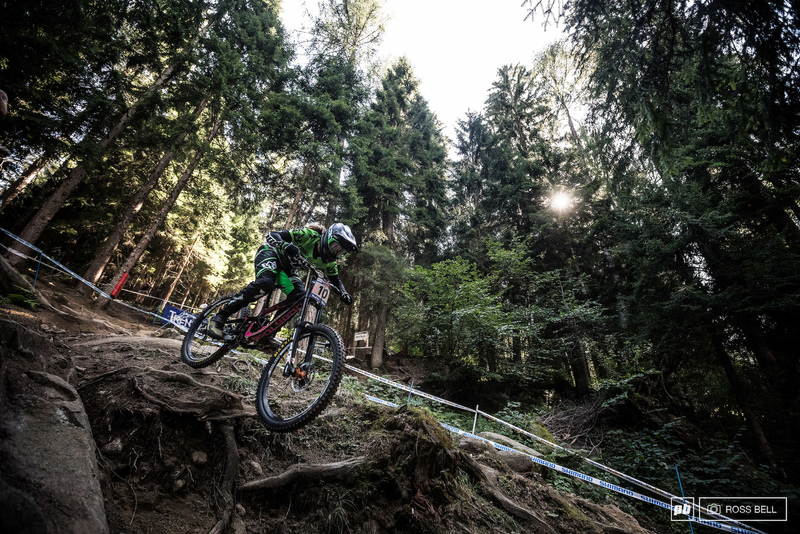 Luca Shaw looking for luck in the loam to counter his plate. 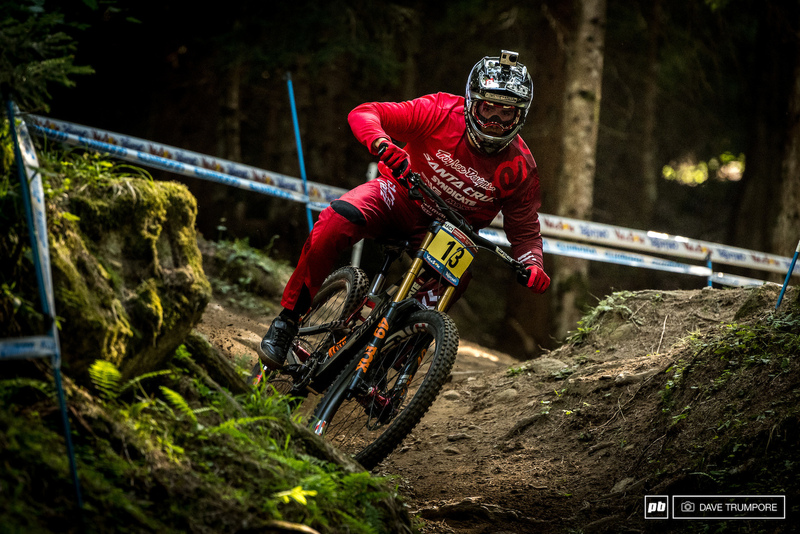 With the overall done and dusted Sylvain Cougoureux knows he can't better his number two ranking so will instead focus on maintaining it. 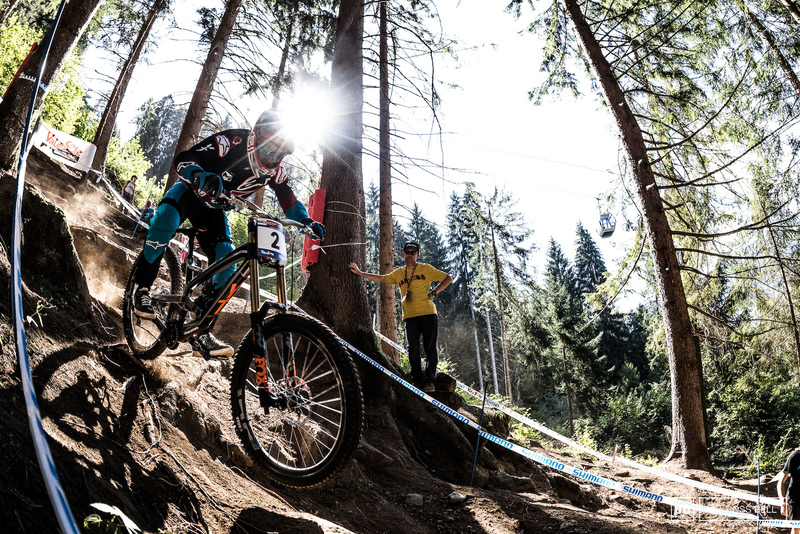 Reece Wilson scrubs the big step-down in the bottom woods. Brendan loves a bit of VDS wildness; watch him turn up the heat in qualies tomorrow. 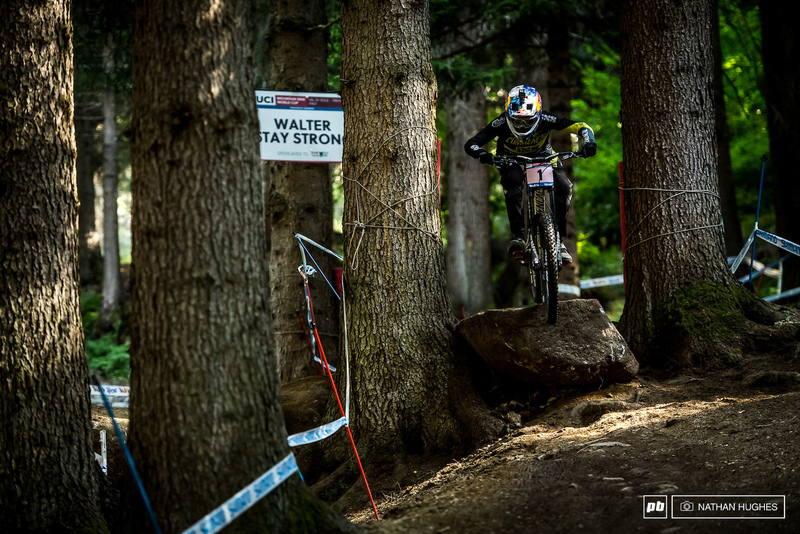 Adam Brayton just held on to this moment. He'll look to clean it up and creep inside the top 20 overall. 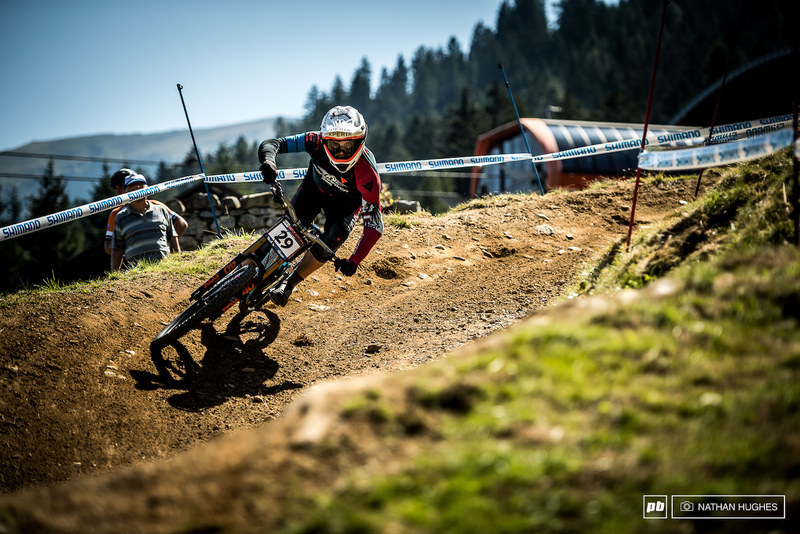 Loris Vergier has switched back to 27.5 wheel for the final WC of the season. It looks to be vindicated with a 3rd fastest today. Matt Walker about to plunge into the woods and head for a wild ride. Walker is looking pinned here and his time would have seen him sitting 8th in elites. With a 77 point deficit it might be a long shot for Troy Brosnan to move up in the series, unless of course those in front of him falter on race day. 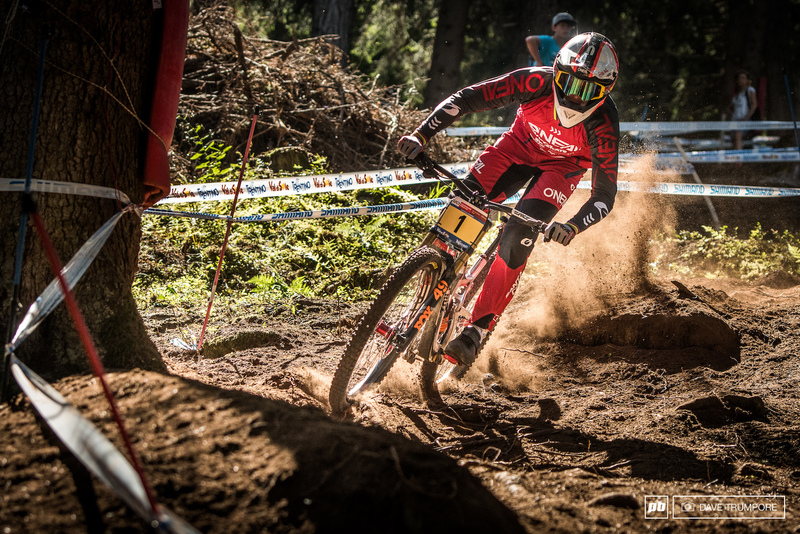 Italian national champ, Francesco Colombo, romping through his 'home' woods. 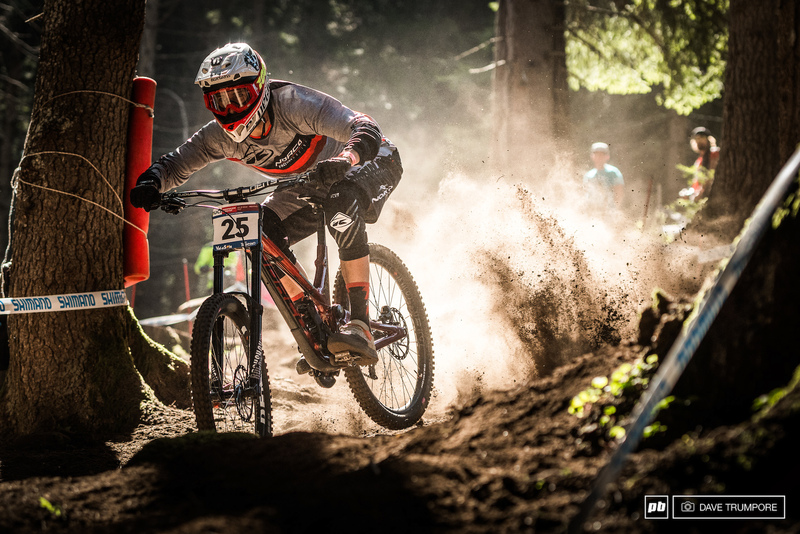 Miranda Miller, low and mean and fighting to boost her plate number in a season dogged by injury. 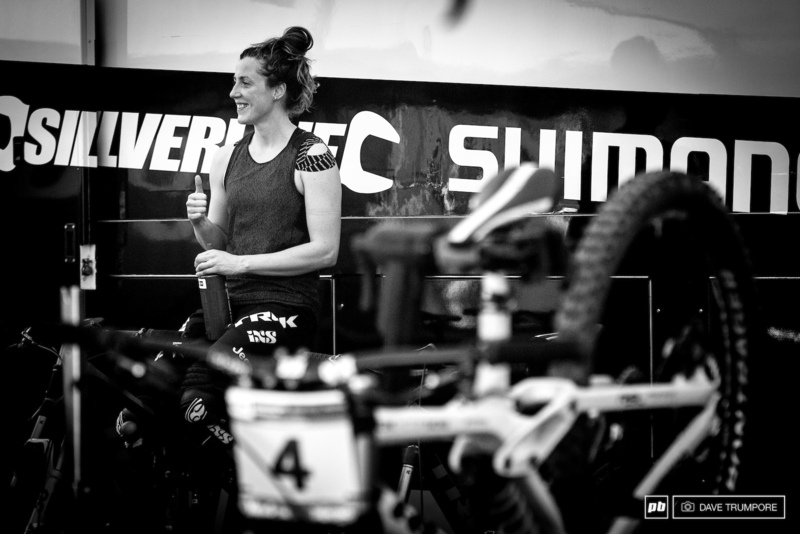 Rachel is looking to go out with a win and carry the momentum into World Champs. Kade Edwards takes no chances of a hand / tree interaction. David Trummer roosts out of the new rock garden near the bottom of the Black Snake. 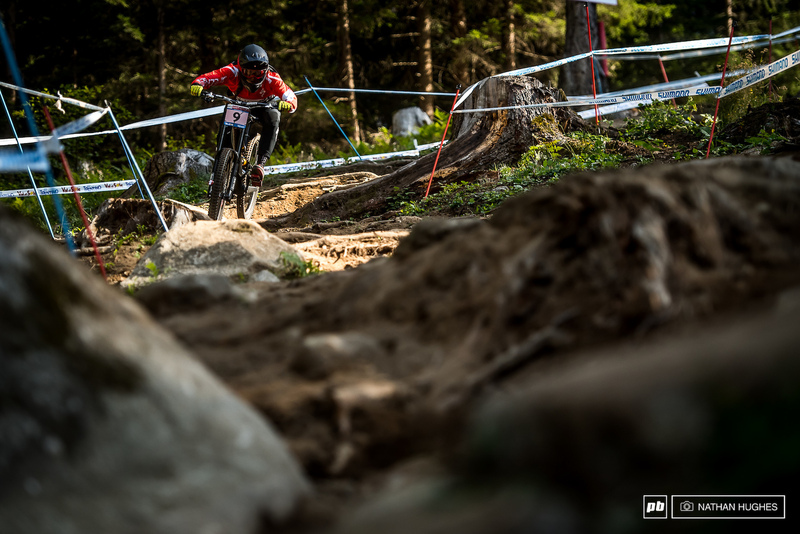 Greg Minnaar took things steady in practice, looking at each section and hiking back up to re-ride quite a few others. By timed training he had it all down though, and set the fastest time of the day. Plenty of roost being thrown around the hillside today. 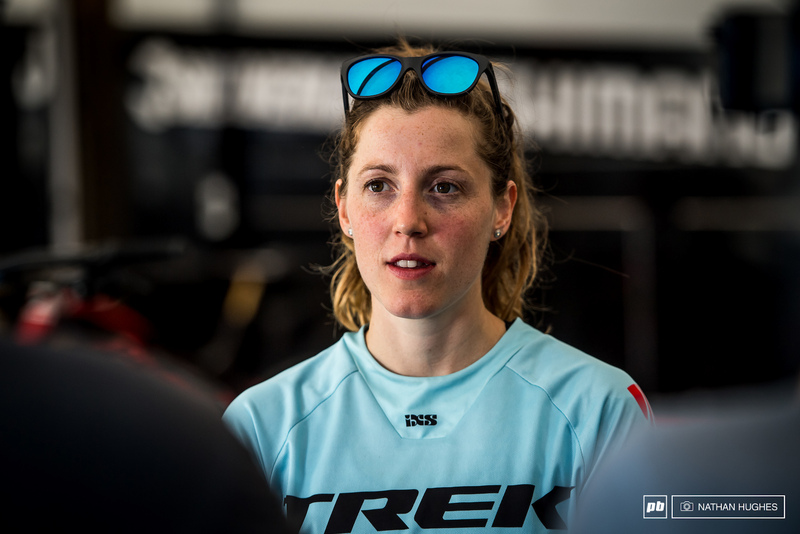 Eleonora Farina scoring 2nd in the TT today on home soil. 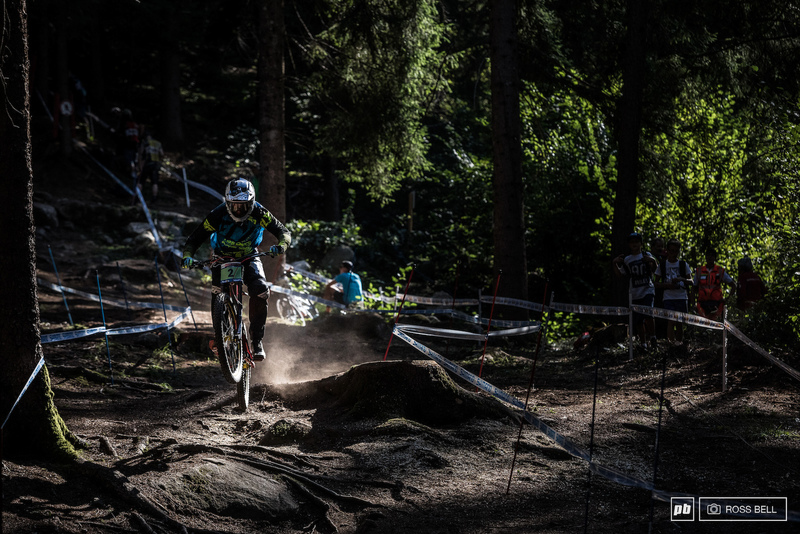 Gaetan Vige roosting his own top tube as he enters the first section of woods. Greg Williamson hit the course hard and seemed to find the kind of pace and flow we're used to seeing from him. 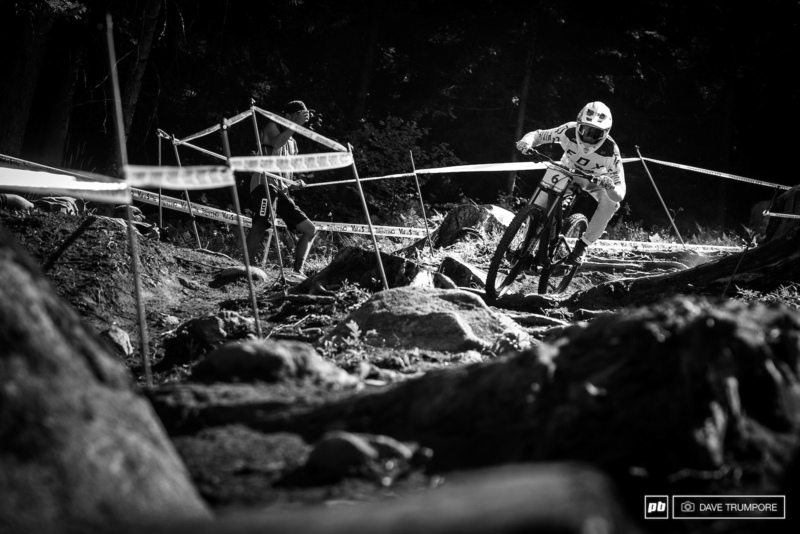 Emilie Siegenthaler has been having her best WC season ever and is looking to cap it off with another trip to the podium. 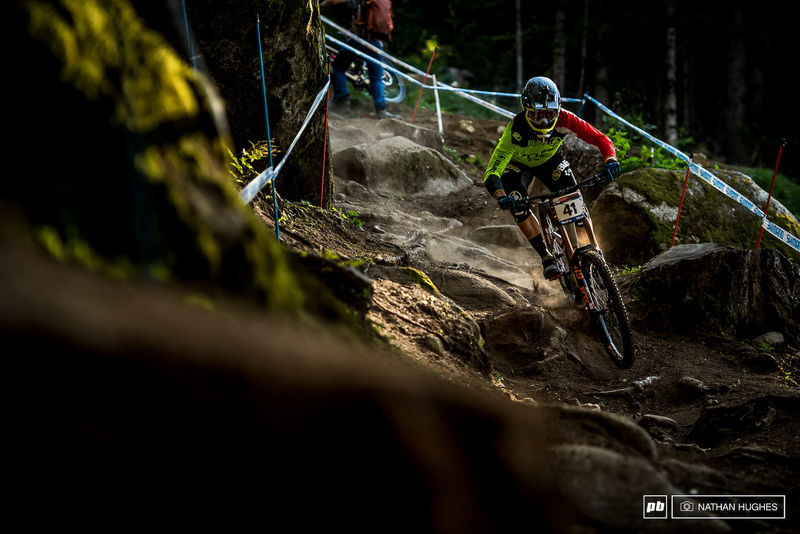 No hiding of emotions or intentions here at round 7... Minnaar took the gondola up to set the fastest time of the day by over 3 seconds. It's a big weekend ahead. Really big. After being on top for as long as anyone can remember, Rachel is still all smiles and having fun. Even with the number four strapped to the front of her bike. 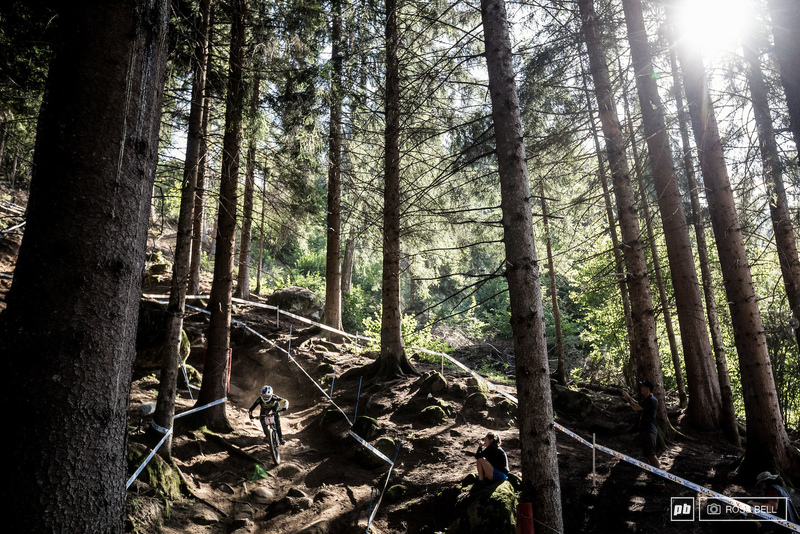 Dust and massive roots, rocks, and holes mean the suspension needs some extra love at the end of the day in Val di Sole. 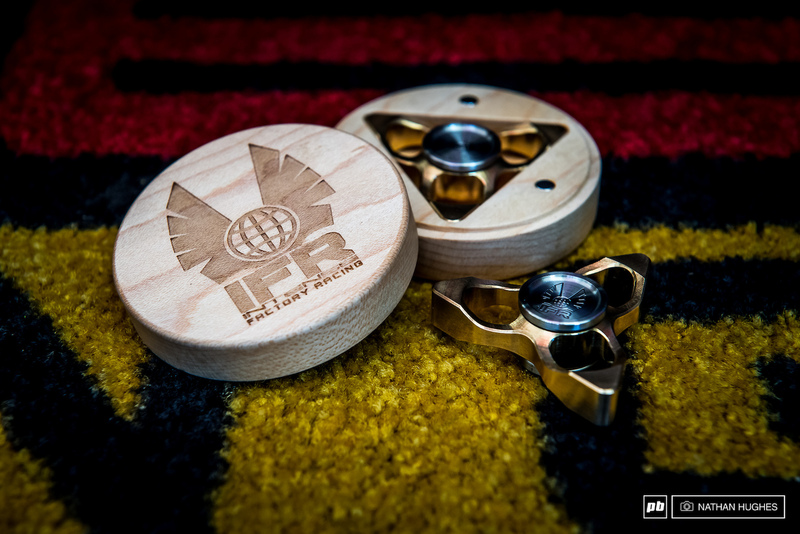 Some custom fidgetery from Intense to keep the riders minds steady for this final round. 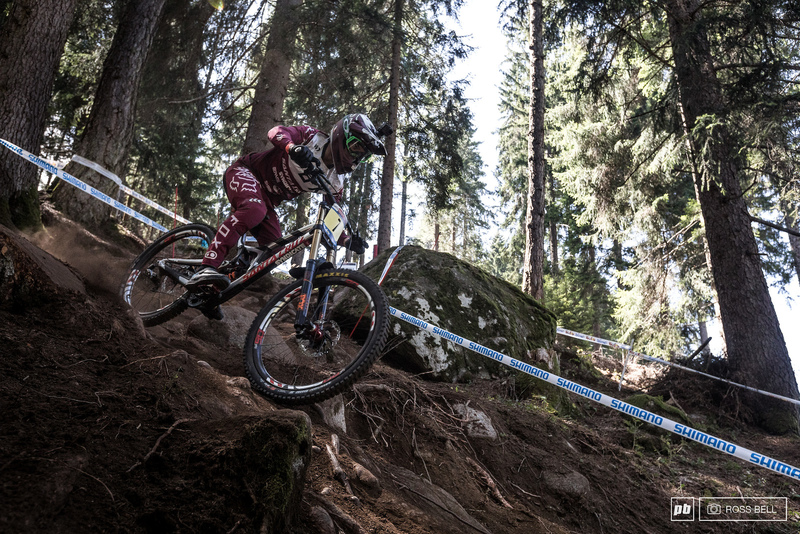 The Track in Val di Sole is as rough as they come, and more than a few riders were smoked at the end of training. 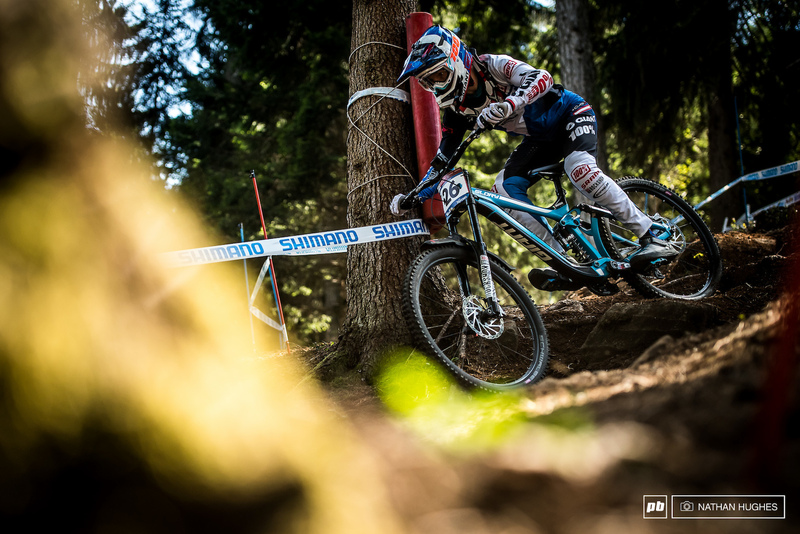 Rachel Atherton sits in 4th going into the final round, not at all bad having missed two rounds and carrying her shoulder injury. 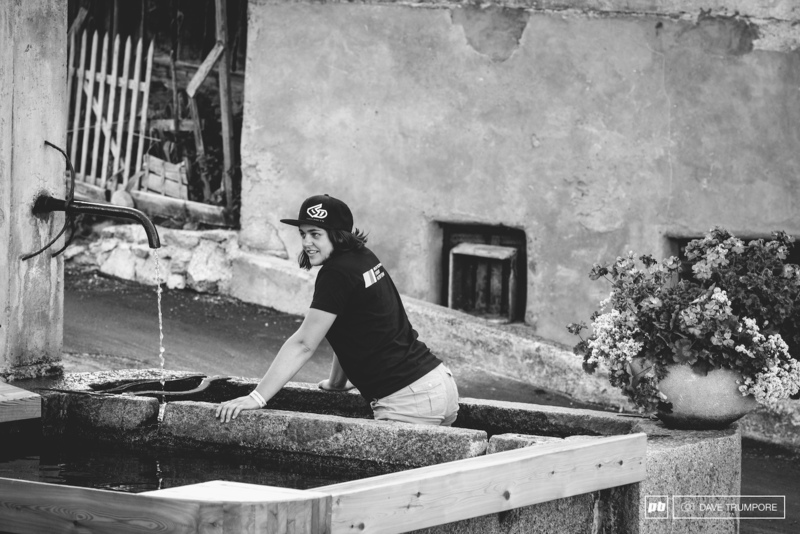 Marine Cabirou took advantage of one of the many fountains that constantly flow icy cold mountain spring water. It's far easier than trying to find ice cubes in Europe to make a more traditional ice bath. The Valley of Sun living up to its namesake. Nice of Hannah to lend out her old bike to another girl. Stoked to see how everyone does this weekend! Forget #MayMac. It's all about #GwinMinn this weekend. Dakota Nortons been riding a Session as of late. No more Morpheus for him? 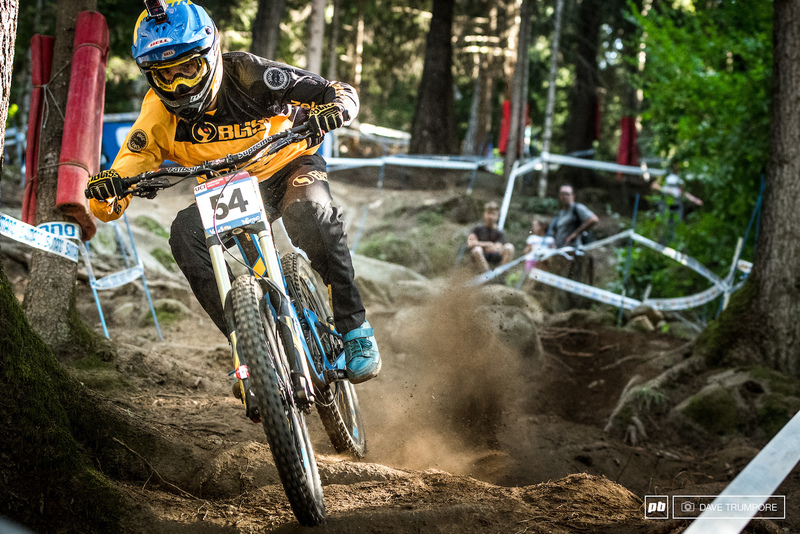 He was riding a Ticket S in the Dual Slalom at Whistler too. Still in his morpheus kit though? He's still on Morpheus as far as it would appear (lists them as a sponsor, etc), but my guess is he broke his frame and they don't have one in stock for him, or something along those lines. 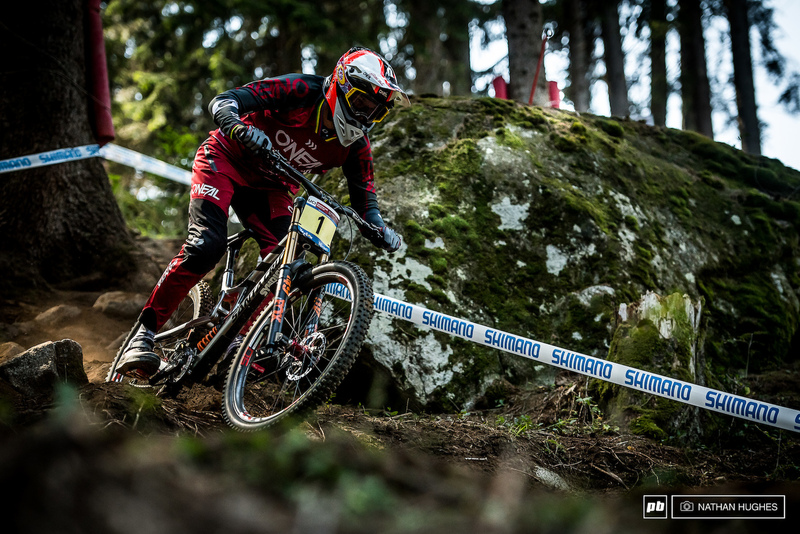 With smaller company like that, and especially it being their flagship carbon dh bike (read: expensive to produce and stock), that would be my best guess. Anyone wanting some on track / behind the scenes type insights from an ex-world cup downhiller should take a look at Ben Cathro's channel on You Tube. 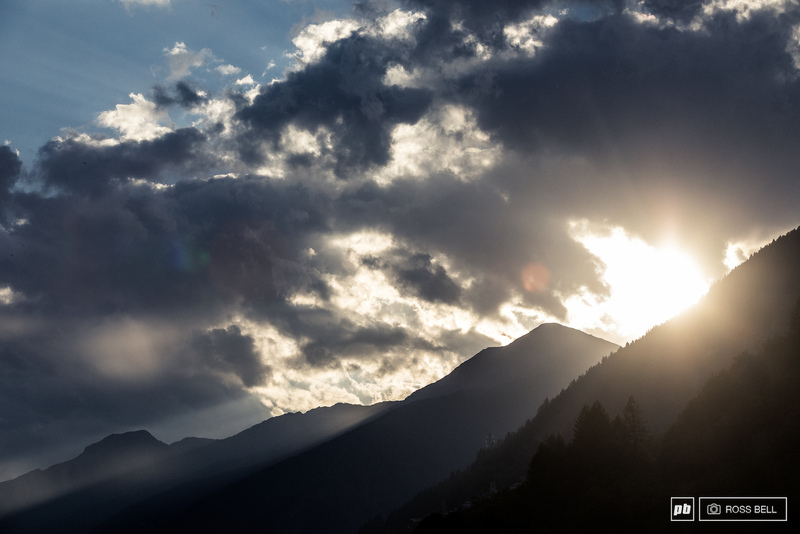 Some cracking stuff on Val Di Sole and Ben's a natural blogger. aye! Ben videos are so good it's whats missing from a world cup weekend. Inside knowledge and great questions to the riders. @Weekev: just watched the day2 video (practice & timed training). Thanks for the recommendation, well worth checking out. @Footey72: i think PB might be using his footage of Gregs frame split. Just watched the latest one as we get a sneak preview for sponsoring him to fly there. Basically he started doing it at FT Bill and people liked it so much he wanted to do more, but he'd lose money by losing coaching days, so did a crowdfunding type deal to get money for the flights. 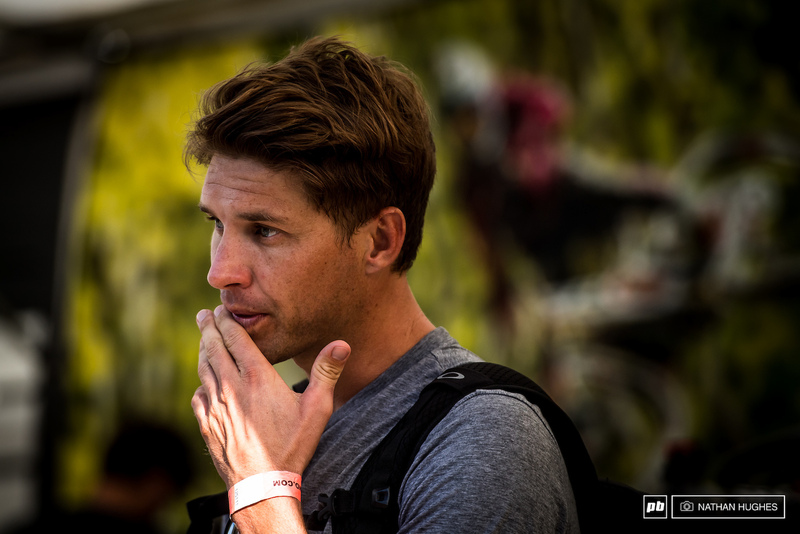 He still races nationals for DH and Enduro and has a race team with a couple of great juniors. Famous for coming top,ten at ft bill with a black rubber ski suit! @Weekev: It does look to be the case, though it does look to be a section with a lot of media guys present. If they did use Ben's footage, I hope they'll update and give him credit. 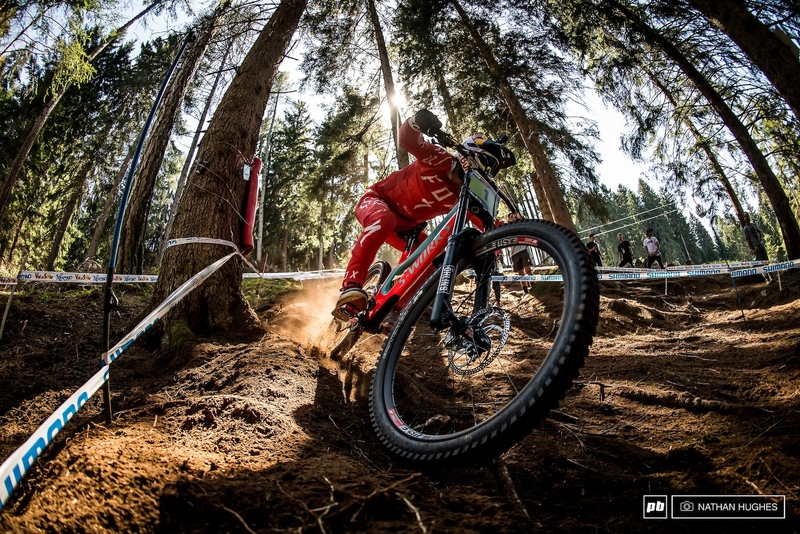 Can we get top 10 riders tire choice? Looks mostly like shorty's and mary's, but some look to be running minions. Actually just bike checks really. Custom fidgetry?! Whatever it takes I guess..
Do U ev-n ceramic bearings in ya fidget bro? 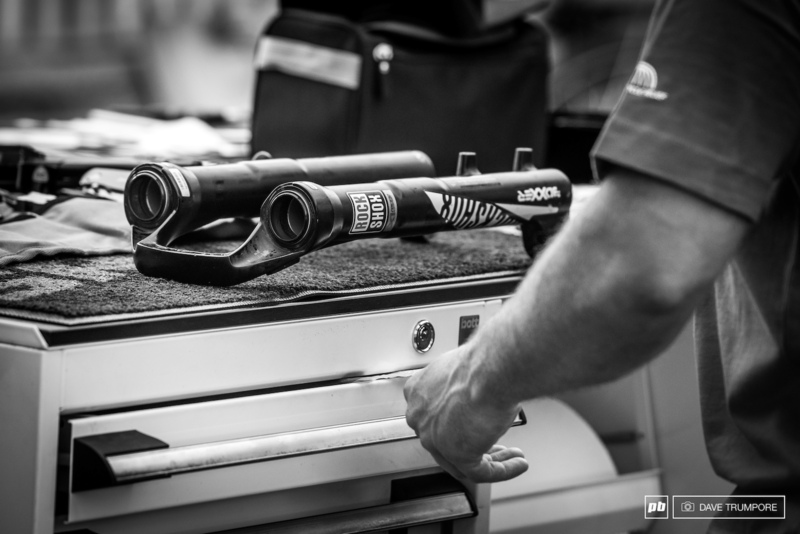 Keen to see how Tracy goes with that new bike, i guess setting up for that long pedal finish at world champs. I hope Kade keeps doing what he's doing and doesn't get all serious. Great to watch and keeping it fun seems to be working for him. 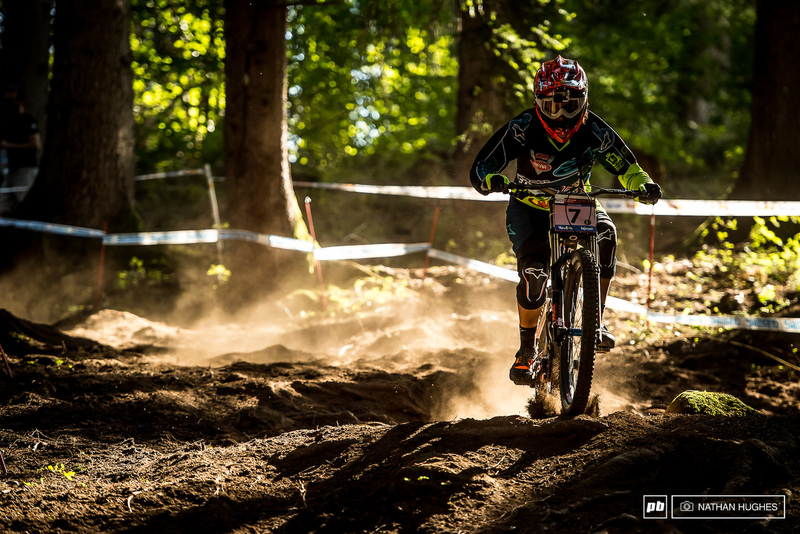 Great to see a young talent like Norton representing the US! Thanks to all the [media guys] for there images for past few rounds as well with out them we would be in the Dark, and They always put such good spin on things !!!! 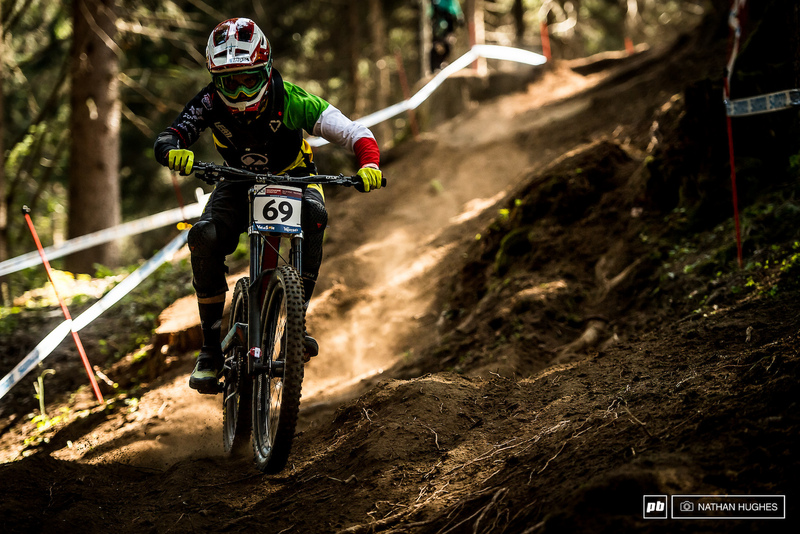 Will Minnaar and Moir remain the only riders on 29? Only the tall need apply. He wasn't riding today, so likely still carrying a bit of an injury. Too bad though, as he would be looking good on a track like this. 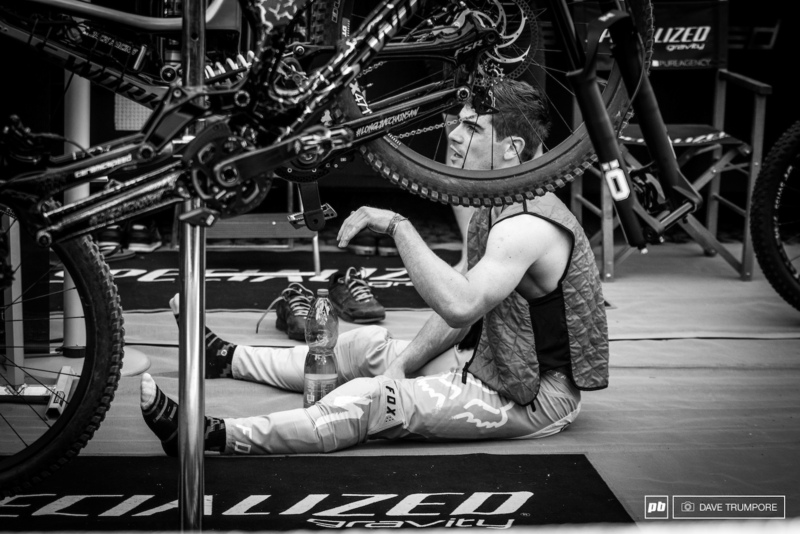 Pinkbike is a good way to improve his English. So today: dwarf is a verb. Ok.
Requirement for vds for health and safety reasons I believe. One of the intense boys has cut the Palm and inside fingers out of his haha. A fine set of pics to round off a great (albeit short) season. The one of Dean Lucas does it for me. 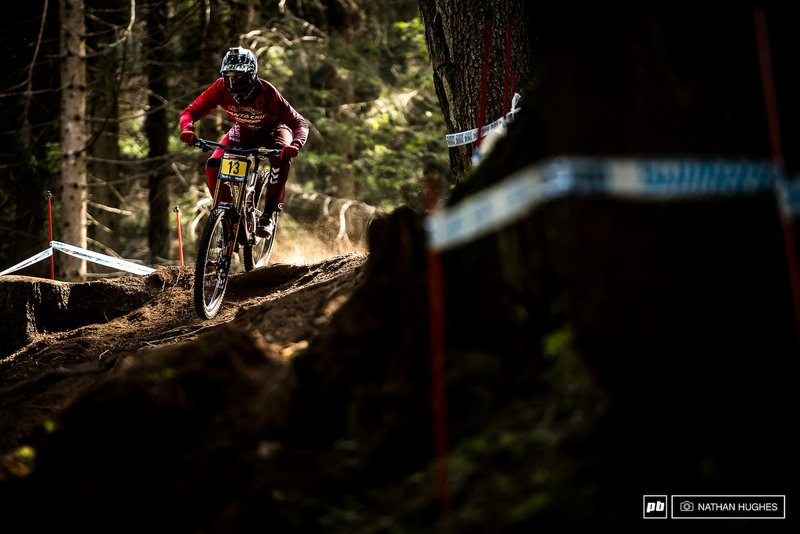 I want Gwin to win, there I said it. chrome stanctions finish on Farina's fox 40? will quali live timing be available? Interesting to see so many riders without a lower chain guide. 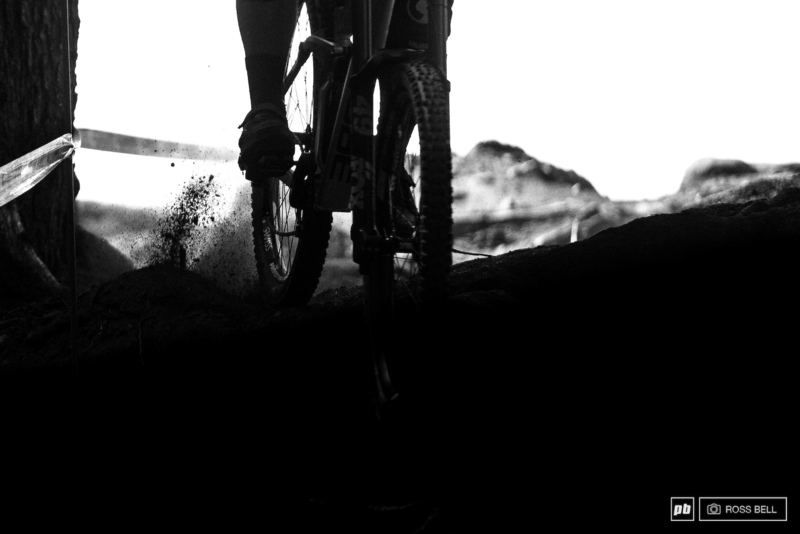 He's is still on the 29er for sure. Still photo's are wonderful, they seem to capture the moment so well. What’s Loic wearing? A down vest or weird padding? I think it's a cooling vest. You get it wet and it holds water and cools you as the water evaporates. At least it looks just like one I used to use when riding motorbikes in the desert. Minnaar's stack height it's huge! I can't believe the heads at Polygon thought that bike was a good idea. It's an e-bike without a motor.